John IV, Duke of Brabant (11 June 1403 – 17 April 1427) was the son of Antoine of Burgundy, Duke of Brabant, Lothier and Limburg and his first wife Jeanne of Saint-Pol. He was the second Brabantian ruler from the House of Valois. John was born in Arras, and succeeded as duke of Brabant in 1415, after his father's death at the Battle of Agincourt. However, his succession was not immediately accepted by everyone. The holy Roman emperor Sigismund contested his succession, as he wished to curb the Valois influence (read: the influence of the duke of Burgundy, John's uncle) in the region. John the Fearless, the duke of Burgundy, naturally supported his nephew, as did the States of Brabant. Their joint support prevented a second succession war in the duchy. Furthermore, through their support of John as the new duke, the States of Brabant gained regency over the duchy until the coming of age of the still underage duke. In 1418, he married Jacqueline, Countess of Hainaut. Jacqueline's supporters hoped that the marriage would provide a protector - in the person of John IV of Brabant - of Jacqueline's inheritance against the claims of her uncle John III. Through their marriage, the counties of Holland, Zeeland and Hainaut and the duchies of Brabant and Limburg were united in a personal union. However, the marriage did not provide the stability sought after by Jacqueline and her supporters and eventually led to estrangement of the couple in 1420. One of the reasons was his incapability to protect her rights in Holland and Zeeland. 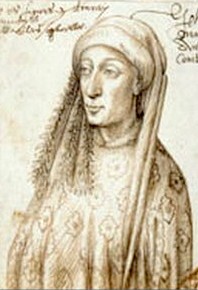 His attempts in the first year of their marriage, such as the disastrous Siege of Dordrecht (summer of 1418), were insufficient against the force of Jacqueline's uncle, John III. Another reason why their marriage and John's attempts to defend Jacqueline's rights in Holland and Zeeland did not succeed was that John's closest advisors were all part of the Cod faction, while Jacqueline's supporters were of the Hook faction in the Hook and Cod disputes. This meant an inevitable political struggle. Under influence of his advisors, John appointed Jacqueline's uncle, John III, as regent (Dutch: ruwaard) of Holland in 1420. This open support of her uncle caused Jacqueline to flee her husband's court and declared their marriage annulled. After the death of John III in 1425, the county of Holland once again fell to John IV. However, he immediately appointed his cousin Philip the Good, duke of Burgundy, as the new regent as well as his heir in case he died without issue. Coat of Arms of the Dukes of Brabant of the Burgundy family. That John's advisors were of the Cod faction did not only cause friction in John's marriage to Jacqueline, but also caused tensions in the Duchy of Brabant. There was a great discontent amongst the cities and the aristocracy who had been powerful under his father's reign against these powerful advisors. When Jacqueline left her husband in 1420, the States of Brabant sided with her. They appointed John's brother, Philip of Saint-Pol, regent of Brabant. A forceful reaction of the duke against these measures was prevented by the uprising of the Brussels guilds. This meant that, for the time being, John had to bend to their wishes. A reconciliation treaty was made in 1421 and John was restored to his full ducal powers. In return, he expanded the city privileges and the powers of the States of Brabant in 1422, a measure called the Nieuw Regiment. With this reconciliation, the States of Brabant supported their duke in his fight against Jacqueline and her new husband, Humphrey, Duke of Gloucester. He never accepted the annulment of their marriage, and was post-mortem backed up by the pope in 1428. John died in Brussels in 1427, aged 23, without issue. This meant his claims on Holland, Zeeland and Hainaut, as husband of Jacqueline, were transferred to Philip the Good. His duchies of Brabant and Limburg were inherited by his younger brother, Philip of Saint-Pol. He is often typified as a weak prince, who was easily influenced by more shrewd and politically able men, such as Philip the Good and John III of Holland. His age and inexperience would have played a major role in this characterization. In 1425, he founded the University of Leuven. Though it was dissolved during the French Revolutionary Wars, it has two successor institutions that are considered to be the oldest universities in the Low Countries, and the oldest Catholic universities in the world still in operation.